We are a team of professional and dedicated educators, international teacher-volunteers and qualified Indonesian teachers who implement an international-based English curriculum integrated with Indonesian curriculum guidelines. We include Math, Science and Social Studies subjects in our teachings to widen the students’ knowledge during the course of their studies. Our teachers undergo regular and extensive training to bring out their maximum potential as educators, not only language teachers. Our teaching is a work of Heart. What makes us different from the rest of the language school? We inspire children to learn English through holistic approach – that is Learning by doing. Meaning, by using interactive learning method, all aspects of a child’s individuality including psychological, physical and social skills are taken into consideration and therefore strengthen to achieve their personal goals, and so our teachers provide different learning strategies to attain the best results. 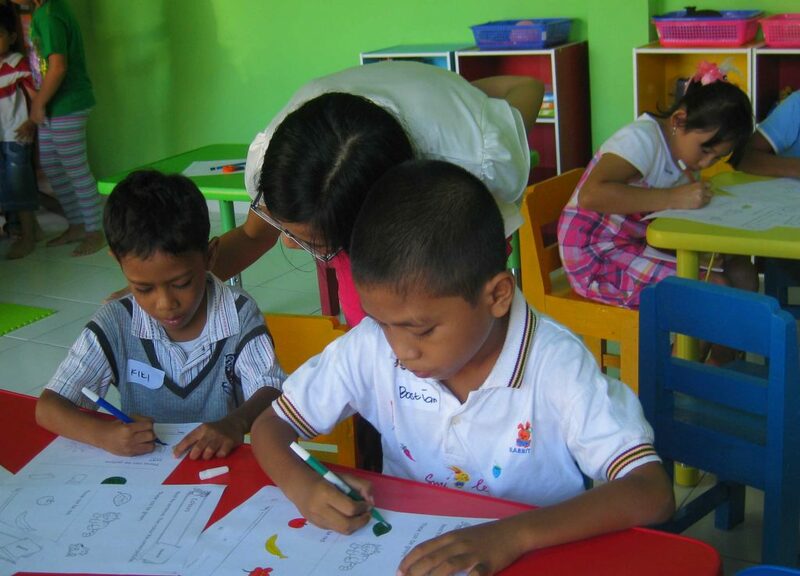 Development of Multiple-Intelligence through our classroom activities; English lesson is integrated with Music, Art, Math and other subjects is also one of the main focus of our work as educators. We also inculcate ‘Good Manners and Right Conduct (GMRC)’ by providing real life situations and examples during our English lessons, to teach students moral values to help them build characters and enable them to face the real world.